Bouchard, B. (2017). Smart technologies in healthcare. Boca Raton: CRC Press, Taylor & Francis Group. La Chance, M., & Robertson, R. (2017). Les bruits et les feux de l’Ouiatchouan : les archéologies poétiques de Richard Robertson. Chicoutimi (Québec): Éditions Interritoires. Lemonnier, L., & Ouellet, F. (2017). Manifeste du roman populiste. Paris: Éditions La thébaïde. Halle, S., Gaboury, S., & Khoury, R. (2016, 5-8 december). A glue language for event stream processing. Communication présentée au Proceedings – 2016 IEEE International Conference on Big Data, Big Data 2016, Washington, United States. Hannech, A., Adda, M., & McHeick, H. (2016, 18-20 December). Recommendation model based on a contextual similarity measure. Communication présentée au Proceedings – 2016 15th IEEE International Conference on Machine Learning and Applications, ICMLA 2016, Anaheim, United States. Khoury, R., Shi, L., & Hamou-Lhadj, A. (2016, 2-10 octobre). Key elements extraction and traces comprehension using gestalt theory and the helmholtz principle. Communication présentée au Proceedings – 2016 IEEE International Conference on Software Maintenance and Evolution, ICSME 2016, Raleigh, United States. Ashoka, S., Saleema, N., & Sarkar, D. K. (2017). Tuning of superhydrophobic to hydrophilic surface: A facile one step electrochemical approach. Journal of Alloys and Compounds, 695, 1528-1531. Baatti, A., Erchiqui, F., Bébin, P., Godard, F., & Bussières, D. (2017). A two-step Sol-Gel method to synthesize a ladder polymethylsilsesquioxane nanoparticles. Advanced Powder Technology, 28(3), 1038-1046. Bedeaux, P., Pilote, P., Daigneault, R., & Rafini, S. (2017). Synthesis of the structural evolution and associated gold mineralization of the Cadillac Fault, Abitibi, Canada. Ore Geology Reviews, 82, 49-69. Bui, H. T., Gagnon, C., Audet, O., Mathieu, J., & Leone, M. (2017). Measurement properties of a new wireless electrogoniometer for quantifying spasticity during the pendulum test in ARSACS patients. Journal Of The Neurological Sciences, 375, 181-185. Burrows, K. S., Bearman, M., Dion, J., & Powell, M. B. (2017). Children’s use of sexual body part terms in witness interviews about sexual abuse. Child Abuse & Neglect, 65, 226-235. Charles, A., & Guérard, F. (2015). Portrait d’une institution oubliée : l’hôpital privé à but lucratif, 1900-1960. Canadian Bulletin Of Medical History = Bulletin Canadien D’histoire De La Medecine, 32(1), 101-122. Chen, W., Wang, T., Pino-Yanes, M., Forno, E., Liang, L., Yan, Q., Celedón, J. C. (2017). An epigenome-wide association study of total serum IgE in Hispanic children. The Journal Of Allergy And Clinical Immunology. Deschênes, G. (2017). Note de lecture de l’ouvrage sous la direction de J. P. Viriot Durandal, E. Raymond et M. Charpentier (2015). Droits de vieillir et citoyenneté des aînées : pour une perspective internationale. Québec : Presses de l’Université du Québec. Vie et Viellissement, 14(2), 56-57. Ertz, M., Durif, F., & Arcand, M. (2017). Life after death? Study of goods multiple lives practices. Journal of Consumer Marketing, 34(2), 108-118. Ertz, M., François, J., & Durif, F. (2017). How Consumers React to Environmental Information: An Experimental Study. Journal of International Consumer Marketing, 1-17. Farid, H., Saeidi, A., & Farzaneh, M. (2017). Prediction of failure in atmospheric ice under triaxial compressive stress. Cold Regions Science and Technology, 138, 46-56. Forstner, A. J., Hecker, J., Hofmann, A., Maaser, A., Reinbold, C. S., Mühleisen, T. W., Nöthen, M. M. (2017). Identification of shared risk loci and pathways for bipolar disorder and schizophrenia. Plos One, 12(2), e0171595-e0171595. Fortin, M., Chouinard, M.-C., Dubois, M.-F., Bélanger, M., Almirall, J., Bouhali, T., & Sasseville, M. (2016). Integration of chronic disease prevention and management services into primary care: a pragmatic randomized controlled trial (PR1MaC). CMAJ Open, 4(4), E588-E598. Gallais, B., Gagnon, C., Forgues, G., Côté, I., & Laberge, L. (2017). Further evidence for the reliability and validity of the Fatigue and Daytime Sleepiness Scale. Journal Of The Neurological Sciences, 375, 23-26. Généreux, M., Petit, G., Maltais, D., Roy, M., Simard, R., Boivin, S., Pinsonneault, L. (2015). The public health response during and after the Lac-Mégantic train derailment tragedy: a case study. Disaster Health, 2(3-4), 113-120. Gheribi, A. E., Poncsák, S., Guérard, S., Bilodeau, J.-F., Kiss, L., & Chartrand, P. (2017). Thermal conductivity of the sideledge in aluminium electrolysis cells: Experiments and numerical modelling. The Journal Of Chemical Physics, 146(11), 114701-114701. Girard, A., Hudon, C., Poitras, M. E., Roberge, P., & Chouinard, M. C. (2017). Primary care nursing activities with patients affected by physical chronic disease and common mental disorders: A qualitative descriptive study. Journal of Clinical Nursing. Girona, M. M., Rossi, S., Lussier, J. M., Walsh, D., & Morin, H. (2017). Understanding tree growth responses after partial cuttings: A new approach. PLoS ONE, 12(2). Henrique-Pinto, R., Barnes, S. J., Savard, D., & Mehdi, S. (2017). Quantification of Metals and Semimetals in Carbon-Rich Rocks: A New Sequential Protocol Including Extraction from Humic Substances. Geostandards and Geoanalytical Research, 41(1), 41-62. Imhoff, S., Lavallière, M., Germain-Robitaille, M., Teasdale, N., & Fait, P. (2017). Training driving ability in a traumatic brain-injured individual using a driving simulator: A case report. International Medical Case Reports Journal, 10, 41-45. Lafond, C., Blanchet, P., Galimard, P., Landry, V., & Ménard, S. (2017). Impact of a reinforcement treatment with acrylate impregnation on the mechanical behavior of black spruce as connector member. Construction and Building Materials, 141, 517-525. Laforte, C., & Tremblay, M. M. (2017). Comparative evaluation of the anti-icing protection time of runway deicers using infrared thermography. Cold Regions Science and Technology, 138, 57-62. Lalande, D., Vallerand, R. J., Lafrenière, M.-A. K., Verner-Filion, J., Laurent, F.-A., Forest, J., Laurent, F.-A. (2017). Obsessive Passion: A Compensatory Response to Unsatisfied Needs. Journal of Personality, 85(2), 163-178. Lavoie, S., Côté, I., Pichette, A., Gauthier, C., Ouellet, M., Nagau-Lavoie, F., Legault, J. (2017). Chemical composition and anti-herpes simplex virus type 1 (HSV-1) activity of extracts from Cornus canadensis. BMC Complementary and Alternative Medicine, 17(1). Legault-Venne, A., Laplante, A., Leblanc-Proulx, S., & Forest, D. (2016). Du vinyle à YouTube : les habitudes de consommation et de recherche de musique des jeunes adultes québécois. Partnership, 11(2). Mariash, H., Cusson, M., & Rautio, M. (2017). Fall Composition of Storage Lipids is Associated with the Overwintering Strategy of Daphnia. Lipids, 52(1), 83-91. Mirza, F. A., Macwan, A., Bhole, S. D., Chen, D. L., & Chen, X. G. (2017). Microstructure, tensile and fatigue properties of ultrasonic spot welded aluminum to galvanized high-strength-low-alloy and low-carbon steel sheets. Materials Science and Engineering A, 690, 323-336. Montoro Girona, M., Rossi, S., Lussier, J.-M., Walsh, D., & Morin, H. (2017). Understanding tree growth responses after partial cuttings: A new approach. Plos One, 12(2), e0172653-e0172653. Morin, A., Laviolette, M., Pastinen, T., Boulet, L.-P., & Laprise, C. (2017). Combining omics data to identify genes associated with allergic rhinitis. Clinical Epigenetics, 9, 3-3. Moussette, S., Al Tuwaijri, A., Kohan-Ghadr, H.-R., Elzein, S., Farias, R., Bérubé, J., … Naumova, A. K. (2017). Role of DNA methylation in expression control of the IKZF3-GSDMA region in human epithelial cells. Plos One, 12(2), e0172707-e0172707. Müller, S. H., Girard, S. L., Hopfner, F., Merner, N. D., Bourassa, C. V., Lorenz, D., Rouleau, G. A. (2016). Genome-wide association study in essential tremor identifies three new loci. Brain, 139(12), 3163-3169. Nadaraia, N. S., Onashvili, E. O., Kakhabrishvili, M. L., Barbakadze, N. N., Sylla, B., & Pichette, A. (2016). Synthesis and Antiviral Activity of Several N-Containing 5α-STEROIDS. Chemistry of Natural Compounds, 52(5), 853-855. Pan, L., Liu, K., Breton, F., & Chen, X. G. (2017). Effects of minor Cu and Mg additions on microstructure and material properties of 8xxx aluminum conductor alloys. Journal of Materials Research, 1-11. Pérez-de-Lis, G., Olano, J. M., Rozas, V., Rossi, S., Vázquez-Ruiz, R. A., & García-González, I. (2017). Environmental conditions and vascular cambium regulate carbon allocation to xylem growth in deciduous oaks. Functional Ecology, 31(3), 592-603. Perreault-Payette, A., Muir, A. M., Goetz, F., Perrier, C., Normandeau, E., Sirois, P., & Bernatchez, L. (2017). Investigating the extent of parallelism in morphological and genomic divergence among lake trout ecotypes in Lake Superior. Molecular Ecology, 26(6), 1477-1497. Perrin, M., Rossi, S., & Isabel, N. (2017). Synchronisms between bud and cambium phenology in black spruce: early-flushing provenances exhibit early xylem formation. Tree Physiology, 1-11. Rafini, S., Chesnaux, R., & Ferroud, A. (2017). A numerical investigation of pumping-test responses from contiguous aquifers. Hydrogeology Journal, 1-18. Ragab, K. A., Bouazara, M., Bouaicha, A., & Allaoui, O. (2017). Microstructural and mechanical features of aluminium semi-solid alloys made by rheocasting technique. Materials Science and Technology (United Kingdom), 33(6), 646-655. Roberge, P., Hudon, C., Pavilanis, A., Beaulieu, M.-C., Benoit, A., Brouillet, H., Vanasse, A. (2016). Erratum to: A qualitative study of perceived needs and factors associated with the quality of care for common mental disorders in patients with chronic diseases: the perspective of primary care clinicians and patients. BMC Family Practice, 17(1), 174-174. Samalens, N., Barnes, S. J., & Sawyer, E. W. (2017). The role of black shales as a source of sulfur and semimetals in magmatic nickel-copper deposits: Example from the Partridge River Intrusion, Duluth Complex, Minnesota, USA. Ore Geology Reviews, 81, 173-187. Tremblay, M., & Rouleau, G. (2017). Deep genealogical analysis of a large cohort of participants in the CARTaGENE project (Quebec, Canada). Annals Of Human Biology, 1-9. Varvaressos, S., Lavoie, K., Gaboury, S. E., & Hallé, S. (2017). Automated bug finding in video games: A case study for runtime monitoring. Computers in Entertainment, 15(1). Vieira, J., Nabais, C., Rossi, S., Carvalho, A., Freitas, H., & Campelo, F. (2017). Rain exclusion affects cambial activity in adult maritime pines. Agricultural and Forest Meteorology, 237-238, 303-310. Wong, A. P.-Y., French, L., Leonard, G., Perron, M., Pike, G. B., Richer, L., … Paus, T. (2017). Inter-Regional Variations in Gene Expression and Age-Related Cortical Thinning in the Adolescent Brain. Cerebral Cortex (New York, N.Y.: 1991), 1-10. Xiong, J., Sarkar, D. K., & Chen, X. G. (2017). Superhydrophobic honeycomb-like cobalt stearate thin films on aluminum with excellent anti-corrosion properties. Applied Surface Science, 407, 361-370. Le documentaire intitulé De Compostelle à Kuujjuaq est présenté à la Chasse-galerie de la bibliothèque ce jeudi à 11h45 dans le cadre du Ciné-Nikanite organisé par le Centre des Premières Nations. Réalisé par Simon C. Vaillancourt, le documentaire suit le parcours de Stanley Vollant, premier chirurgien autochtone du Québec et initiateur du projet, Innu Meshkenu, marche de 6000 km qui l’a mené à la rencontre des communautés autochtones du Québec, de l’Ontario et du Labrador. Vous pouvez voir le résultat du projet artistique de Clarynte De Langie jusqu’au 24 avril à l’entrée de la bibliothèque. Rappelons-nous que l’étudiante en arts avait recueilli des mèches de cheveux afin d’en faire une œuvre tissée sur une toile. 5 à 7 à la bibliothèque pour le lancement collectif de livres. Venez en grand nombre! 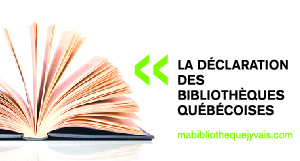 Afin de souligner la Déclaration des bibliothèques québécoises, nous vous invitons à participer en grand nombre au lancement collectif des livres écrits au cours des dernières années par les professeurs et chargés de cours de l’UQAC. Pour l’occasion, bière, vin et bouchées vous seront servis.